All I can say is WOW! I'm so happy that you shared that with me. It made me feel very warm inside. This is my all time favorite- it fully brings the memory of Jimmy to life. I think it perfectly depicts your relationship, and how at ease Jimmy was with himself. Its one of the attributes that I always admired. Jimmy was so comfortable with himself and his humor was so quick-that you know he wasn;t even trying hard to be funny. My kids watched the game the other night- and both said almost at the same time, we miss Uncle Jimmy. 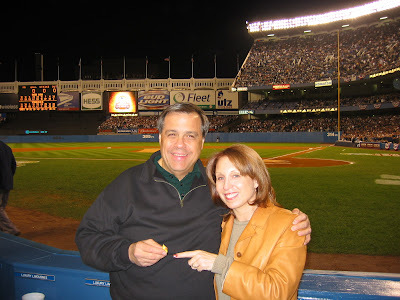 They pulled out there official Yankee Jerseys- ( the real ones that cost $$ that were a gift from Uncle Jimmy and Aunt Carol) and routed for the Yankees-Thanks carol for reposting this- all your new fans and all the Yankee fans out there deserved to read it- Keep up the tradition Doug! I love this blog post. It makes me smile. I One day someone is going to do the fake bump to you so they can start a conversation with you! I never was a baseball fan, but these past couple weeks I have been rooting for Jimmy's Yankees! I even pulled out my wedding video where Jimmy had a Yankee scarf to taunt Marcel with his Mets scarf. Very funny! My late husband had a "duck" too! No, for serious. He had a weakness for little rubber ducks with sad eyes. Something about his childhood... we have all kinds of duckie crap, I am slowly divesting. Wow! What a great memory you have there. I never got to see my husband with a Beatle, but I got to hear him play a lot of Beatles songs. It's so hard to lose your companion of so many years, especially one who is so beloved. I miss my husband every day, every minute. It's good to see other widows are out there recording their experiences. It makes us all feel better.